Consider replacing all that meat and dairy with a diet full of such foods as fresh fruits and vegetables, whole grains, and soy. Meats and diary products contain saturated fats that threaten cardiovascular health. High fiber diets help fight colon cancer. Nuts, seeds, and dark leafy greens provide magnesium to help absorb calcium. Foods rich in potassium reduce risk of cardiovascular diseases and cancer. Folate, a B vitamin, repairs cells, generates red and white blood cells, and matabolizes amino acids. Antioxidants protect against cell damage and help protect against many cancers. Vitamin C boosts the immune system and helps bruises heal faster while keeping gums healthy. A vegan diet tends to be rich in vitamin E, which may help prevent Alzheimer's Disease. Vegans and vegetarians also get plenty of those phytochemicals that can prevent cancer and boost protective enzymes. Because a healthy vegan diet has been shown to prevent a number of dreaded diseases, why do meat eaters resist switching to a vegan way of eating? Many say they worry that a diet of beans, nuts, peas, lentils, and soy products will severely reduce their protein supply. Au contraire. The report said that people eat too much protein, and they ingest it in forms such as red meat that are not healthy. A vegan diet should easily provide all the protein necessary. By eating nuts and whole grains and eliminating diary products and meat, vegans improve their cardiovascular health, reducing risk of heart disease, stroke, and Type 2 diabetes. Plus, their cholesterol levels and blood pressure are lowered. Risk of prostate, colon, and breast cancer can be dramatically reduced by replacing meat and diary products fresh fruits and vegetables. Plenty of leafy greens, carrots, pumpkin, and sweet potatoes can help provent age-related macular degeneration and cataracts. A gluten-free vegan diet can relieve suffering from rheumatoid arthritis. A healthy vegan diet can help prevent osteoporosis as well. It is well known that the typical American diet includes too much food and consists of too many toxins. The average American eats twice as much protein as needed. The human body was never meant to digest cow milk. Yes, eggs really do raise cholesterol levels. Most consumed fish and shellfish have some mercury. And Americans eat way too much sugar. Try a vegan diet and look for these signs of improved health : a noticeable reduction in skin blemishes; healthier looking hair; stronger nails; less intense PMS symptoms (they may even disappear altogether); migraine relief; and fewer runny noses and congestion complaints as allergy symptoms are alleviated. Writing in the November 9, 2009, issue of The New Yorker, author and critic Elizabeth Kolbert reports that Americans will consume 35 million cows, 115 million pigs, and 9 billion birds this year. Those chickens will first be shackled, hung from a conveyor belt, and dipped into an electrified bath called "the stunner." Before the hogs are slaughtered, they will be incapacitated with a tong-like instrument to induce cardiac arrest. Their muscles will contract so violently during this process that they end up not only dead, but with broken backs as well. Cows have bolts blasted into their heads. They may remain conscious as they are skinned and dismembered. People eat all these animals, yet they love their pets. Some 46 million Americans own at least one dog and 38 million keep cats, according to Ms. Kolbert. Pigs make good companions. Dogs are supposed to be delicious. Their caretakers would never think of driving a bolt into Lucy's and Fido's brains before frying those pets up for dinner. This dietary inconsistency is the subject of Jonathan Safran Foer's latest book, the nonfiction Eating Animals (Little, Brown; New York; 2009). In it, he writes, "Food choices are determined by many factors, but reason (even consciousness) is not generally high on the list." May this article play some small part in moving it up the list. Position of the American Dietetic Association: Vegetarian Diets, Journal of American Diet Association, 1997. J.T. Dwyer, Health Aspects of Vegetarian Diets, American Journal of Clinical Nutrition, 1988. A.B. Caragay, "Cancer-Preventative Foods and Ingredients," Food Technology, 1992. World Cancer Research Fund, "Food, Nutrition and the Prevention of Cancer: A Global Perspective, World Cancer Research Fund/American Institute for Cancer Research, Washington, D.C., 1997. "Respecting Animals," The Boston Vegan Association, Boston, MA. 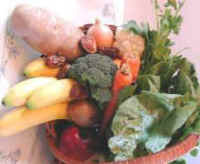 "57 Health Benefits of Going Vegan," The Nursing School Catalog, Nursing Degree.Net.